This article is about the state. For other uses, see Wisconsin (disambiguation). "Badger State" redirects here. For other uses, see Badger State (disambiguation). State song(s): " On, Wisconsin!" Wisconsin ( /wɪˈskɒnsɪn/ ( listen)) is a U.S. state located in the north-central United States, in the Midwest and Great Lakes regions. It is bordered by Minnesota to the west, Iowa to the southwest, Illinois to the south, Lake Michigan to the east, Michigan to the northeast, and Lake Superior to the north. Wisconsin is the 23rd largest state by total area and the 20th most populous. The state capital is Madison, and its largest city is Milwaukee, which is located on the western shore of Lake Michigan. The state is divided into 72 counties. Wisconsin's geography is diverse, having been greatly impacted by glaciers during the Ice Age with the exception of the Driftless Area. 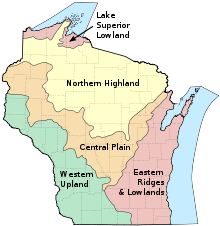 The Northern Highland and Western Upland along with a part of the Central Plain occupies the western part of the state, with lowlands stretching to the shore of Lake Michigan. Wisconsin is second to Michigan in the length of its Great Lakes coastline. During the 19th and early 20th centuries, a large number of European settlers entered the state, many of whom emigrated from Germany and Scandinavia. Like neighboring Minnesota, the state remains a center of German American and Scandinavian American culture. Wisconsin is known as "America's Dairyland"  because it is one of the nation's leading dairy producers, particularly famous for its cheese. Manufacturing (especially paper products), information technology (IT), cranberries, ginseng,  and tourism are also major contributors to the state's economy. The Erie Canal facilitated the travel of both Yankee settlers and European immigrants to Wisconsin Territory. Yankees from New England and upstate New York seized a dominant position in law and politics, enacting policies that marginalized the region's earlier Native American and French-Canadian residents. Yankees also speculated in real estate, platted towns such as Racine, Beloit, Burlington, and Janesville, and established schools, civic institutions, and Congregationalist churches. At the same time, many Germans, Irish, Norwegians, and other immigrants also settled in towns and farms across the territory, establishing Catholic and Lutheran institutions. Wisconsin's economy also diversified during the early years of statehood. While lead mining diminished, agriculture became a principal occupation in the southern half of the state. Railroads were built across the state to help transport grains to market, and industries like J.I. Case & Company in Racine were founded to build agricultural equipment. Wisconsin briefly became one of the nation's leading producers of wheat during the 1860s. Meanwhile, the lumber industry dominated in the heavily forested northern sections of Wisconsin, and sawmills sprang up in cities like La Crosse, Eau Claire, and Wausau. These economic activities had dire environmental consequences. By the close of the 19th century, intensive agriculture had devastated soil fertility, and lumbering had deforested most of the state. These conditions forced both wheat agriculture and the lumber industry into a precipitous decline. Wisconsin took part in several political extremes in the mid to late 20th century, ranging from the anti-communist crusades of Senator Joseph McCarthy in the 1950s to the radical antiwar protests at UW-Madison that culminated in the Sterling Hall bombing in August 1970. The state became a leader in welfare reform under Republican Governor Tommy Thompson during the 1990s. The state's economy also underwent further transformations towards the close of the 20th century, as heavy industry and manufacturing declined in favor of a service economy based on medicine, education, agribusiness, and tourism. Two U.S. Navy battleships, BB-9 and BB-64, were named for the state. The Driftless Area of southwestern Wisconsin is characterized by bluffs carved in sedimentary rock by water from melting Ice Age glaciers. 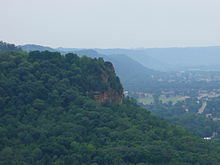 Timms Hill is the highest natural point in Wisconsin at 1,951.5 ft (594.8 m); it is located in the Town of Hill, Price County. Wisconsin is bordered by the Montreal River; Lake Superior and Michigan to the north; by Lake Michigan to the east; by Illinois to the south; and by Iowa to the southwest and Minnesota to the northwest. A border dispute with Michigan was settled by two cases, both Wisconsin v. Michigan, in 1934 and 1935. The state's boundaries include the Mississippi River and St. Croix River in the west, and the Menominee River in the northeast. There is one national forest managed by the U.S. Forest Service in Wisconsin, Chequamegon-Nicolet National Forest. The pole of inaccessibility for Wisconsin, located approximately 15 miles (24 km) southwest of Wausau at 44°52′57″N 89°54′43″W﻿ / ﻿44.8824°N 89.912°W﻿ / 44.8824; -89.912﻿ (Wisconsin Pole of Inaccessibility), marks the location furthest from any point not within Wisconsin (94.24 mi or 151.66 km). The table below shows the racial composition of Wisconsin's population as of 2016. Since its founding, Wisconsin has been ethnically heterogeneous. Following the period of French fur traders, the next wave of settlers were miners, many of whom were Cornish, who settled the southwestern area of the state. The next wave was dominated by "Yankees", migrants of English descent from New England and upstate New York; in the early years of statehood, they dominated the state's heavy industry, finance, politics, and education. Between 1850 and 1900, the immigrants were mostly Germans, Scandinavians (the largest group being Norwegian), Irish, and Poles. In the 20th century, a number of African Americans and Mexicans settled in Milwaukee; and after the end of the Vietnam War came an influx of Hmongs. The various ethnic groups settled in different areas of the state. Although German immigrants settled throughout the state, the largest concentration was in Milwaukee. Norwegian immigrants settled in lumbering and farming areas in the north and west. Irish, Italian, and Polish immigrants settled primarily in urban areas. Menominee County is the only county in the eastern United States with a Native American majority. Note: Births in table add to over 100%, because Hispanics are counted both by their ethnicity and by their race, giving a higher overall number. The percentage of Wisconsin residents who belong to various affiliations are  Christian 81% ( Protestant 50%, Roman Catholic 29%, Mormon 0.5%), Jewish 0.5%, Muslim 0.5%, Buddhist 0.5%, Hindu 0.5%, and unaffiliated 15%. Statewide FBI Crime statistics for 2009 include 144 murders/non-negligent manslaughter; 1,108 rapes; 4,850 robberies; 8,431 aggravated assaults; and 147,486 property crimes. Wisconsin also publishes its own statistics through the Office of Justice Assistance. The OJA reported 14,603 violent crimes in 2009, with a clearance rate (% solved) of 50%. The OJA reported 4,633 sexual assaults in 2009, with an overall clearance rate for sexual assaults of 57%. The Wisconsin Blue Book is the primary published reference about the government and politics of the state, documenting the organization of the state's three branches of government. Published every two years with updated information, copies are available by contacting state legislators. Wisconsin's Constitution outlines the structure and function of state government. Wisconsin's government is organized into three branches: executive, legislative, and judicial. The executive branch is headed by the governor. The current governor, Tony Evers, assumed office on January 7, 2019. In addition to the governor, the executive branch includes five other elected constitutional officers: Lieutenant Governor, Secretary of State, Attorney General, Treasurer, and State Superintendent of Public Instruction. Four members of the Wisconsin executive branch are Democrats. The Superintendent of Public Instruction of Wisconsin is a non-partisan position. The Wisconsin State Legislature is Wisconsin's legislative branch. The Legislature is a bicameral body consisting of the Assembly and the Senate. In the United States Senate Wisconsin is represented by Ron Johnson and Tammy Baldwin. Wisconsin is divided into eight congressional districts. Wisconsin collects personal income taxes (based on five income brackets) which range from 4% to 7.65%. The state sales and use tax rate is 5.0%. Fifty-nine counties have an additional sales/use tax of 0.5%. Milwaukee County and four surrounding counties have an additional temporary 0.1% tax that helps fund the Miller Park baseball stadium, which was completed in 2001. The most common property tax assessed on Wisconsin residents is the real property tax, or their residential property tax. Wisconsin does not impose a property tax on vehicles, but does levy an annual registration fee. Property taxes are the most important tax revenue source for Wisconsin's local governments, as well as major methods of funding school districts, vocational technical colleges, special purpose districts and tax incremental finance districts. Equalized values are based on the full market value of all taxable property in the state, except for agricultural land. In order to provide property tax relief for farmers, the value of agricultural land is determined by its value for agricultural uses, rather than for its possible development value. Equalized values are used to distribute state aid payments to counties, municipalities, and technical colleges. Assessments prepared by local assessors are used to distribute the property tax burden within individual municipalities. There are no toll roads in Wisconsin; highway construction and maintenance are funded in part by motor fuel tax revenues, and the remaining balance is drawn from the State General Fund. Non-highway road construction and maintenance are funded by local governments (municipalities or counties). 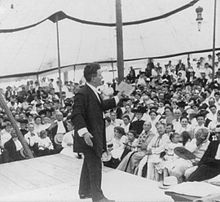 Wisconsin's political history encompasses, on the one hand, "Fighting Bob" La Follette and the Progressive movement; and on the other, the Republican and anti-Communist Joe McCarthy. From the early 20th century, the Socialist Party of America had a base in Milwaukee. The phenomenon was referred to as " sewer socialism" because the elected officials were more concerned with public works and reform than with revolution (although revolutionary socialism existed in the city as well). Its influence faded in the late 1950s, largely because of the red scare and racial tensions. The first Socialist mayor of a large city in the United States was Emil Seidel, elected mayor of Milwaukee in 1910; another Socialist, Daniel Hoan, was mayor of Milwaukee from 1916 to 1940; and a third, Frank P. Zeidler, from 1948 to 1960. Succeeding Frank Zeidler, the last of Milwaukee's Socialist mayors, ( Henry Maier), a former Wisconsin State Senator and member of the Democratic Party was elected mayor of Milwaukee in 1960. Maier remained in office for 28 years, the longest-serving mayor in Milwaukee history. Socialist newspaper editor Victor Berger was repeatedly elected as a U.S. Representative, although he was prevented from serving for some time because of his opposition to the First World War. Wisconsin congressman Paul Ryan was the 2012 Republican Party nominee for Vice-President. Wisconsin had supported Democratic presidential candidates since the 1984 presidential election. However, Donald Trump won Wisconsin by fewer than 25,000 votes (a margin of less than .8%) in the 2016 election. This marked the first time Wisconsin voted for a Republican presidential candidate since 1984, when every state except Minnesota and Washington D.C. went Republican. In 2012, Republican presidential candidate Mitt Romney chose Wisconsin Congressman Paul Ryan, a native of Janesville, as his running mate against incumbent Democratic President Barack Obama and Vice President Joe Biden. Obama nevertheless carried Wisconsin by a margin of 53% to 46%. Both the 2000 and 2004 presidential elections were quite close, with Wisconsin receiving heavy doses of national advertising, in accord with its status as a "swing", or pivot, state. Al Gore carried the presidential vote in 2000 by 5,700 votes, and John Kerry won Wisconsin in 2004 by 11,000 votes. Again, Barack Obama carried the state in 2008 by 381,000 votes (56%). Republicans had a stronghold in the Fox Valley, but elected a Democrat, Steve Kagen, of Appleton, for the 8th Congressional District in 2006. However, Kagen survived only two terms and was replaced by Republican Reid Ribble in the Republican Party's sweep of Wisconsin in November 2010, the first time the Republican Party has taken back both chambers of the state legislature and the governorship in the same election. Republicans have held Waukesha County. The City of Milwaukee heads the list of Wisconsin's Democratic strongholds, which also includes Madison and the state's Native American reservations. Wisconsin's largest Congressional district, the 7th, had voted Democratic since 1969. Its representative, David Obey, chaired the powerful House Appropriations Committee. However, Obey retired and the once Democratic seat was overtaken by Republican Sean Duffy in November 2010. The 2010 elections saw a huge Republican resurgence in Wisconsin. Republicans took control of the governor's office and both houses of the state legislature. Republican Ron Johnson defeated Democratic incumbent U.S. Senator Russ Feingold and Republicans took two previously Democratic-held House seats, creating a 5–3 Republican majority House delegation. With the election of Scott Walker in 2010, Republicans won both chambers of the legislature and the governorship, the first time all three changed partisan control in the same election. His first year in office saw the introduction of the 2011 Wisconsin Act 10, which removed collective bargaining rights for state employees. On February 14, 2011, the Wisconsin State Capitol erupted with protests when the Legislature took up a bill that would end most collective bargaining rights for state employees, except for wages, to address the $3.6 bil. deficit. The protests attracted tens of thousands of people each day,[ when?] and garnered international attention. The Assembly passed the bill 53–42 on March 10 after the State Senate passed it the night before, and sent it to the Governor for his signature. In response to the bill, enough signatures were gathered to force a recall election against Governor Walker. Tom Barrett, the mayor of Milwaukee and Walker's 2010 opponent, won the Democratic primary and faced Walker again. Walker won the election by 53% to 46% and became the first governor in United States history to retain his seat after a recall election. Following the 2014 general election on November 4, 2014, the Governor, Lieutenant Governor, State Attorney General and State Treasurer were all Republicans; the Secretary of State is a Democrat. However, Walker was defeated for a third term in 2018 by Democrat Tony Evers. Democratic U.S. Senator Tammy Baldwin was also elected to a second term and Democrats won all constitutional statewide offices on the ballot including Lieutenant Governor, Attorney General, Secretary of State, and State Treasurer, the first to happen in Wisconsin since 1982. Later however, in April 2019, conservative judge Brian Hagedorn defeated his liberal opponent Lisa Neubauer by 6100 votes. The U.S. Bank Center in Milwaukee is Wisconsin's tallest building. A tree map depicting Wisconsin industries by share of employees working in the state. Data is sourced from 2014 ACS PUMS 5-year Estimate published by the US Census Bureau. A large part of the state's manufacturing sector includes commercial food processing, including well-known brands such as Oscar Mayer, Tombstone frozen pizza, Johnsonville brats, and Usinger's sausage. Kraft Foods alone employs over 5,000 people in the state. Milwaukee is a major producer of beer and was formerly headquarters for Miller Brewing Company – the nation's second-largest brewer – until it merged with Coors Brewing Company. Formerly, Schlitz, Blatz, and Pabst were cornerstone breweries in Milwaukee. State Song: " On, Wisconsin!" Wisconsin is home to a very large and diversified manufacturing economy, with special focus on transportation and capital equipment. Major Wisconsin companies in these categories include the Kohler Company; Mercury Marine; Rockwell Automation; Johnson Controls; John Deere; Briggs & Stratton; Milwaukee Electric Tool Company; Miller Electric; Caterpillar Inc.; Joy Global; Oshkosh Corporation; Harley-Davidson; Case IH; S. C. Johnson & Son; Ashley Furniture; Ariens; and Evinrude Outboard Motors. Wisconsin is a major producer of paper, packaging, and other consumer goods. Major consumer products companies based in the state include SC Johnson & Co., and Diversey, Inc. Wisconsin also ranks first nationwide in the production of paper products; the lower Fox River from Lake Winnebago to Green Bay has 24 paper mills along its 39 miles (63 km) stretch. The development and manufacture of health care devices and software is a growing sector of the state's economy, with key players such as GE Healthcare, Epic Systems, and TomoTherapy. Wisconsin is served by eight commercial service airports, in addition to a number of general aviation airports. The Wisconsin Department of Transportation is responsible for planning, building and maintaining the state's highways. Eight Interstate Highways are located in the state. Over 68% of Wisconsin residents live in urban areas, with the Greater Milwaukee area home to roughly one-third of the state's population. With over 594,000 residents, Milwaukee is the 30th-largest city in the country. The string of cities along the western edge of Lake Michigan is generally considered to be an example of a megalopolis. Wisconsin has three types of municipality: cities, villages, and towns. Cities and villages are incorporated urban areas. Towns are unincorporated minor civil divisions of counties with limited self-government. Today, public post-secondary education in Wisconsin includes both the 26-campus University of Wisconsin System, with the flagship university University of Wisconsin–Madison, and the 16-campus Wisconsin Technical College System. Private colleges and universities include Alverno College, Beloit College, Cardinal Stritch University, Carroll University, Carthage College, Concordia University Wisconsin, Edgewood College, Lakeland College, Lawrence University, Marquette University, Medical College of Wisconsin, Milwaukee School of Engineering, Ripon College, St. Norbert College, Wisconsin Lutheran College, Viterbo University, and others. Residents of Wisconsin are referred to as Wisconsinites. The traditional prominence of references to dairy farming and cheesemaking in Wisconsin's rural economy (the state's license plates have read "America's Dairyland" since 1940 ) have led to the nickname (sometimes used pejoratively among non-residents) of " cheeseheads", and to the creation of "cheesehead hats" made of yellow foam in the shape of a wedge of cheese. The Milwaukee Art Museum, with its brise soleil designed by Santiago Calatrava, is known for its interesting architecture. Monona Terrace in Madison, a convention center designed by Taliesin architect Anthony Puttnam, is based on a 1930s design by Wisconsin native Frank Lloyd Wright. 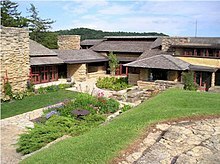 Wright's home and studio in the 20th century was at Taliesin, south of Spring Green. Decades after Wright's death, Taliesin remains an architectural office and school for his followers. Drinking has long been considered a significant part of Wisconsin culture, and the state ranks at or near the top of national measures of per-capita alcohol consumption, consumption of alcohol per state, and proportion of drinkers. Consumption per-capita per-event, however, ranks low among the nation; number of events (number of times alcohol is involved) is significantly higher or highest, but consumption at each event smaller, marking Wisconsin's consumption as frequent and moderate. Factors such as cultural identification with the state's heritage of German immigration, the long-standing presence of major breweries in Milwaukee, and a cold climate are often associated with the prevalence of drinking in Wisconsin. Outdoor activities are popular in Wisconsin, especially hunting and fishing. One of the most prevalent game animals is the whitetail deer. Each year, in Wisconsin, well over 600,000 deer-hunting licenses are sold. In 2008, the Wisconsin Department of Natural Resources projected the pre-hunt deer population to be between 1.5 and 1.7 million. Lambeau Field in Green Bay is home to the NFL's Green Bay Packers. Wisconsin also has many college sports programs, including the Wisconsin Badgers, of the University of Wisconsin–Madison and the Panthers of the University of Wisconsin–Milwaukee. The Wisconsin Badgers football former head coach Barry Alvarez led the Badgers to three Rose Bowl championships, including back-to-back victories in 1999 and 2000. The Badger men's basketball team won the national title in 1941 and made trips to college basketball's Final Four in 2000, 2014, and 2015. The Badgers claimed a historic dual championship in 2006 when both the women's and men's hockey teams won national titles. The Semi-Professional Northern Elite Football League consists of many teams from Wisconsin. The league is made up of former professional, collegiate, and high school players. Teams from Wisconsin include: The Green Bay Gladiators from Green Bay, The Fox Valley Force in Appleton, The Kimberly Storm in Kimberly, The Central Wisconsin Spartans in Wausau, The Eau Claire Crush and the Chippewa Valley Predators from Eau Claire, and the Lake Superior Rage from Superior. The league also has teams in Michigan and Minnesota. Teams play from May until August. ^ Herman, Jennifer L. (2008). Wisconsin Encyclopedia, American Guide. North American Book Dist LLC. p. 10. ISBN 9781878592613. Nicknames Wisconsin is generally known as The Badger State, or America's Dairyland, although in the past it has been nicknamed The Copper State. ^ " Wisconsin State Symbols" in Wisconsin Blue Book 2005–2006, p. 966. ^ "Wisconsin State Symbols". Wisconsin Historical Society. Retrieved May 21, 2015. ^ Journal, Barry Adams | Wisconsin State. "Ginseng continues rebound in central Wisconsin". madison.com. Retrieved August 11, 2018. ^ "Wisconsin's Name: Where it Came from and What it Means". Wisconsin Historical Society. Archived from the original on October 28, 2005. Retrieved July 24, 2008. ^ Marquette, Jacques (1673). "The Mississippi Voyage of Jolliet and Marquette, 1673". In Kellogg, Louise P. (ed.). Early Narratives of the Northwest, 1634–1699. New York: Charles Scribner's Sons. p. 235. OCLC 31431651. ^ Smith, Alice E. (September 1942). "Stephen H. Long and the Naming of Wisconsin". Wisconsin Magazine of History. 26 (1): 67–71. Retrieved July 24, 2008. ^ Vogel, Virgil J. (1965). "Wisconsin's Name: A Linguistic Puzzle". Wisconsin Magazine of History. 48 (3): 181–186. Retrieved July 24, 2008. ^ Theler, James; Boszhardt, Robert (2003). Twelve Millennia: Archaeology of the Upper Mississippi River Valley. Iowa City, Iowa: University of Iowa Press. p. 59. ISBN 978-0-87745-847-0. ^ Boatman, John (1987). "Historical Overview of the Wisconsin Area: From Early Years to the French, British, and Americans". In Fixico, Donald (ed.). An Anthology of Western Great Lakes Indian History. University of Wisconsin–Milwaukee. OCLC 18188646. ^ Rodesch, Gerrold C. (1984). "Jean Nicolet". University of Wisconsin–Green Bay. Archived from the original on January 5, 2013. Retrieved March 13, 2010. ^ "Turning Points in Wisconsin History: Arrival of the First Europeans". Wisconsin Historical Society. Retrieved March 13, 2010. ^ Jaenen, Cornelius (1973). "French colonial attitudes and the exploration of Jolliet and Marquette". Wisconsin Magazine of History. 56 (4): 300–310. ^ "Dictionary of Wisconsin History: Langlade, Charles Michel". Wisconsin Historical Society. Retrieved March 13, 2010. ^ Nesbit, Robert (1973). Wisconsin: A History. Madison, WI: University of Wisconsin Press. pp. 62–64. ISBN 978-0-299-06370-2. ^ "Badger Nickname". University of Wisconsin. Archived from the original on March 23, 2011. Retrieved March 14, 2010. ^ Nesbit (1973). Wisconsin: a history. pp. 95–97. ISBN 978-0-299-06370-2. ^ Murphy, Lucy Eldersveld (2014). Great Lakes Creoles: a French-Indian community on the northern borderlands, Prairie du Chien, 1750–1860. New York: Cambridge University Press. pp. 108–147. ISBN 9781107052864. ^ a b c d Toepel, M. G. (1960). "Wisconsin's Former Governors, 1848–1959". In Kuehn, Hazel L. (ed.). The Wisconsin Blue Book, 1960. Wisconsin Legislative Reference Library. pp. 71–74. Retrieved September 17, 2008. ^ Legler, Henry (1898). "Rescue of Joshua Glover, a Runaway Slave". Leading Events of Wisconsin History. Milwaukee, Wis.: Sentinel. pp. 226–229. Retrieved October 17, 2017. ^ Nesbit (1973). Wisconsin: a history. pp. 238–239. ISBN 978-0-299-06370-2. 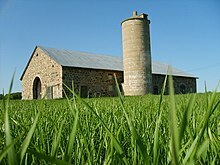 ^ "Turning Points in Wisconsin History: The Iron Brigade, Old Abe and Military Affairs". Wisconsin Historical Society. Retrieved March 13, 2010. ^ Nesbit (1973). Wisconsin: a history. p. 273. ISBN 978-0-299-06370-2. ^ Nesbit (1973). Wisconsin: a history. pp. 281, 309. ISBN 978-0-299-06370-2. ^ Buenker, John (1998). Thompson, William Fletcher (ed.). The Progressive Era, 1893–1914. History of Wisconsin. 4. Madison, WI: State Historical Society of Wisconsin. pp. 25, 40–41, 62. ISBN 978-0-87020-303-9. ^ "Turning Points in Wisconsin History: The Modern Environmental Movement". Wisconsin Historical Society. Retrieved March 13, 2010. ^ Buenker, John (1998). Thompson, William Fletcher (ed.). The Progressive Era, 1893–1914. History of Wisconsin. 4. Madison, WI: State Historical Society of Wisconsin. pp. 80–81. ISBN 978-0-87020-303-9. ^ Stark, John (1987). "The Establishment of Wisconsin's Income Tax". Wisconsin Magazine of History. 71 (1): 27–45. ^ Stark, Jack (1995). "The Wisconsin Idea: The University's Service to the State". The State of Wisconsin Blue Book, 1995–1996. Madison: Legislative Reference Bureau. pp. 99–179. OCLC 33902087. ^ Nelson, Daniel (1968). "The Origins of Unemployment Insurance in Wisconsin". Wisconsin Magazine of History. 51 (2): 109–21. ^ Condon, Stephanie (March 11, 2011). "Wisconsin Gov. Scott Walker signs anti-union bill – but Democrats say they're the political victors". CBS News. Retrieved March 12, 2011. ^ Lawrence Martin (1965). The physical geography of Wisconsin. University of Wisconsin Press. ISBN 978-0-299-03475-7. Retrieved September 14, 2010. ^ "The Eastern Ridges and Lowlands of Wisconsin". Wisconsin Online. Retrieved September 14, 2010. ^ Webcitation.org, Wisconline.com, September 14, 2010. ^ United States Department of Agriculture Natural Resources Conservation Service (April 1999). "Wisconsin State Soil: Antigo Silt Loam" (PDF). ^ "Wisconsin". National Park Service. Retrieved July 17, 2008. ^ a b "Sister-States and Cities". International Wisconsin. February 4, 2010. Archived from the original on February 4, 2010. Retrieved February 23, 2012. ^ Benedetti, Michael. 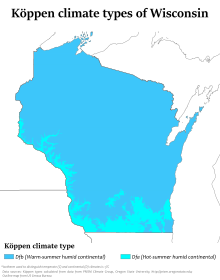 "Climate of Wisconsin". The University of Wisconsin–Extension. Archived from the original on January 5, 2013. Retrieved March 16, 2007. ^ "Monthly Averages for Superior, WI (54880) – weather.com". Retrieved May 29, 2013. ^ a b "QuickFacts Wisconsin; UNITED STATES". 2018 Population Estimates. United States Census Bureau, Population Division. February 8, 2019. Retrieved February 8, 2019. ^ "B03002 HISPANIC OR LATINO ORIGIN BY RACE - Wisconsin - 2017 American Community Survey 1-Year Estimates". U.S. Census Bureau. July 1, 2017. Retrieved October 11, 2018. ^ Population Division, Laura K. Yax. "Historical Census Statistics on Population Totals By Race, 1790 to 1990, and By Hispanic Origin, 1970 to 1990, For The United States, Regions, Divisions, and States". Archived from the original on August 6, 2012. ^ "Population of Wisconsin – Census 2010 and 2000 Interactive Map, Demographics, Statistics, Quick Facts – CensusViewer". ^ "Wisconsin Blue Book 2003–2004" (PDF). Archived from the original (PDF) on March 25, 2009. Retrieved July 25, 2010. ^ ""Ancestry: 2000", U.S. Census Bureau" (PDF). Archived from the original (PDF) on September 20, 2004. Retrieved July 25, 2010. ^ Miller, Frank H., "The Polanders in Wisconsin", Parkman Club Publications No. 10. Milwaukee, Wis.: Parkman Club, 1896; retrieved January 29, 2008. ^ "Wisconsin's Hmong Population" (PDF). University of Wisconsin–Madison Applied Population Laboratory. Retrieved April 26, 2010. ^ American FactFinder Archived August 15, 2014, at the Wayback Machine. Factfinder2.census.gov; retrieved August 2, 2013. ^ Carroll, Brett E. (December 28, 2000). The Routledge Historical Atlas of Religion in America. Routledge Atlases of American History. Routledge. ISBN 978-0-415-92137-4. ^ The Pew Forum. U.S.Religious Landscape Survey, Appendix 1, p. 97. Pew Research Center, 2008. ^ "The Association of Religion Data Archives | State Membership Report". www.thearda.com. Retrieved December 16, 2013. ^ "Contact". Archived from the original on February 6, 2015. Retrieved January 25, 2015. ^ "Table 5 – Crime in the United States 2009". .fbi.gov. Retrieved September 15, 2013. 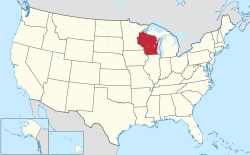 ^ "Wisconsin Court System – court system overview". Wicourts.gov. September 28, 2011. Retrieved February 18, 2012. ^ "County Sales Tax Distribution-2007". Wisconsin Department of Revenue. March 6, 2007. Archived from the original on May 13, 2008. Retrieved March 24, 2007. ^ "Wisconsin Department of Revenue". Revenue.wi.gov. Archived from the original on July 22, 2010. Retrieved July 25, 2010. ^ "Mexican Consulate to open in Milwaukee on July 1". jsonline.com. ^ Kellogg, Louise Phelps (September 1918). "The Bennett Law in Wisconsin". Wisconsin Magazine of History. 2 (1): 3. JSTOR 4630124. ^ Smith, Kevin D. (Spring 2003). "From Socialism to Racism: The Politics of Class and Identity in Postwar Milwaukee". Michigan Historical Review. 29 (1): 71–95. doi: 10.2307/20174004. JSTOR 20174004. ^ Conant, James K. (March 1, 2006). "1". Wisconsin Politics and Government: America's Laboratory of Democracy. University of Nebraska Press. ISBN 978-0-8032-1548-1. ^ "David Obey, former U.S. Representative". GovTrack.us. Retrieved February 18, 2012. ^ Abby Sewell (February 27, 2011). "Protesters out in force nationwide to oppose Wisconsin's anti-union bill". Los Angeles Times. ^ Walters, S.; Marley, P. (November 9, 2008). "ELECTION 2008 Darling Wins Despite Tough Day for GOP Democrats to Control Assembly for First Time in 14 Years". Milwaukee Journal Sentinel. p. Z3 – via ProQuest. ^ "Wisconsin Assembly passes bill to curb collective bargaining". CNN. March 10, 2011. ^ Wisconsin 2014 election results, wisconsinvote.org; accessed November 5, 2014. ^ "WORKnet – Major Employer". ^ "Total Cheese Production Excluding Cottage Cheese – States and United States: February 2010 and 2011" in United States Department of Agriculture, Dairy Products Archived January 13, 2012, at the Wayback Machine, p. 13. ^ "American Cheese Production – States and United States: February 2010 and 2011" in United States Department of Agriculture, Dairy Products Archived January 13, 2012, at the Wayback Machine, p. 14. ^ "Milk Cows and Production – 23 Selected States: March 2011 and 2012" in United States Department of Agriculture, Milk Production[ permanent dead link], p. 3. ^ "Table 6: Per Capita Milk Production by State, 2003" in CITEC, The Dairy Industry in the U.S. and Northern New York Archived April 26, 2012, at the Wayback Machine, p. 25. ^ a b U.S. Department of Agriculture, Wisconsin Ag News– Cranberries, June 27, 2017, p. 1. ^ a b United States Department of Agriculture. 2012 Census of Agriculture: United States Summary and State Data, Vol. 1. Washington, DC: 2014, pp. 475-476. ^ Walters, Steven. "Doyle flips decision, puts cow on quarter". Milwaukee Journal Sentinel. Archived from the original on March 21, 2007. Retrieved March 30, 2007. ^ Wisconsin Department of Agriculture, Trade and Consumer Protection. Alice in Dairyland. ^ Sherman, Elisabeth. "Wisconsin Finally Gets Around to Naming Cheese Their Official State Dairy Product". Food & Wine. Time Inc. Retrieved July 10, 2017. ^ Birgit Leisen, "Image segmentation: the case of a tourism destination." Journal of services marketing (2001) 15#1 pp: 49–66 on Oshkosh. ^ ""Commerce study slams film incentives law" The Business Journal of Milwaukee March 31, 2009". Bizjournals.com. March 31, 2009. Retrieved July 25, 2010. ^ a b "U.S. Energy Information Administration – EIA – Independent Statistics and Analysis". ^ "As wind power industry grows, so does opposition - Walla Walla Union-…". December 20, 2014. Archived from the original on December 20, 2014. ^ Naylor. "Number and Percent of Total Population by Urban/Rural Categories for Wisconsin Counties: April 1, 2000". State of Wisconsin, Department of Administration. Archived from the original (PDF) on March 11, 2007. Retrieved March 16, 2007. ^ "Milwaukee (city), Wisconsin". U.S. Census Bureau. Archived from the original on February 7, 2014. ^ "Biggest US Cities By Population - Wisconsin - 2017 Populations". February 8, 2019. ^ Rudolph, Frederick (1990). The American College and University: A History. The University of Georgia Press, Athens and London. 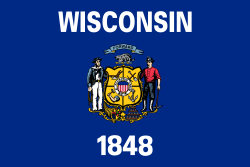 ^ "Wisconsin Fairs and Festivals – Travel Wisconsin". TravelWisconsin. ^ a b "Wisconsin Country Music Festivals". Eaux Claires. Retrieved June 22, 2017. ^ "WAMI – Wisconsin Area Music Industry". ^ Rick Romell (October 19, 2008). "Drinking deeply ingrained in Wisconsin's culture". Milwaukee Journal Sentinel. Archived from the original on January 14, 2012. Retrieved August 18, 2011. ^ "Wisconsin Department of Revenue, Alcohol Age Questions". Archived from the original on December 13, 2014. ^ "Wasted in Wisconsin". Milwaukee Journal Sentinel. Archived from the original on July 15, 2010. Retrieved July 25, 2010. ^ Statistical Abstract of the United States: 2012 (PDF). U.S. Government Printing Office. 2012. p. 223. Archived from the original (PDF) on October 17, 2011. Retrieved November 23, 2012. ^ "A Chronology Of Wisconsin Deer Hunting From Closed Seasons To Antlerless Permits" (Press release). Wisconsin Department of Natural Resources. November 12, 2005. Archived from the original on February 11, 2007. Retrieved March 16, 2007. ^ "Story of the Braves – History". Atlanta Braves. ^ NBA Hoops Online Bucks History, accessed February 17, 2015. ^ "Milwaukee Wave Professional Indoor Soccer". ^ "Wisconsin Intercollegiate Athletic Conference". ^ "Milwaukee Mile Website – History". Milwaukeemile.com. Archived from the original on June 7, 2010. Retrieved July 25, 2010. ^ "Kenosha Velodrome Association". 333m.com. Retrieved July 25, 2010. ^ "Whistling Straits Named as Site for PGA Championships & Ryder Cup Matches". Cybergolf.com a CBS Sports partner. Retrieved September 28, 2014. ^ Greenstein, Teddy (July 5, 2014). "Erin Hills making changes in advance of 2017 U.S. Open". Chicago Tribune. Retrieved June 15, 2016. Barone, Michael; Cohen, Richard E. (2005). The Almanac of American Politics, 2006. Washington, DC: National Journal. ISBN 978-0-89234-112-2. Current, Richard (2001). Wisconsin: A History. Urbana, IL: University of Illinois Press. ISBN 978-0-252-07018-1. Gara, Larry (1962). A Short History of Wisconsin. Madison, WI: State Historical Society of Wisconsin. Holmes, Fred L. (1946). Wisconsin. 5 vols. Chicago, IL. Detailed popular history and many biographies. Nesbit, Robert C. (1989). Wisconsin: A History (Rev. ed.). Madison: University of Wisconsin Press. ISBN 978-0-299-10800-7. Pearce, Neil (1980). The Great Lakes States of America. New York: Norton. ISBN 978-0-393-05619-8. Quaife, Milo M. (1924). Wisconsin, Its History and Its People, 1634–1924. 4 vols. Detailed popular history & biographies. Raney, William Francis (1940). Wisconsin: A Story of Progress. New York: Prentice-Hall. Robinson, Arthur H.; Culver, J. B., eds. (1974). The Atlas of Wisconsin. Sisson, Richard, ed. (2006). The American Midwest: An Interpretive Encyclopedia. Bloomington, IN: Indiana University Press. ISBN 978-0-253-34886-9. Tuttle, Charles R (1875), An Illustrated History of the State of Wisconsin: Being a Complete Civil, Political, and Military History of the State from its First Exploration down to 1875, Madison, WI: B. B. Russell . Van Ells, Mark D. (2009). Wisconsin [On-The-Road Histories]. Northampton, MA: Interlink Books. ISBN 978-1-56656-673-5. Vogeler, I. (1986). Wisconsin: A Geography. Boulder: Westview Press. ISBN 978-0-86531-492-4. Wisconsin Cartographers' Guild (2002). Wisconsin's Past and Present: A Historical Atlas. Works Progress Administration (1941). Wisconsin: A Guide to the Badger State. Detailed guide to every town and city, and cultural history. Wisconsin (PDF). National Atlas (map). United States Government. "Wisconsin state symbols". State of Wisconsin. "Traveling by public transit", Travel Information, Wisconsin Department of Transportation . Wisconsin (Maps), The American Geographical Society Library .